As promised I spent from 11am to 3pm at SASSME today. 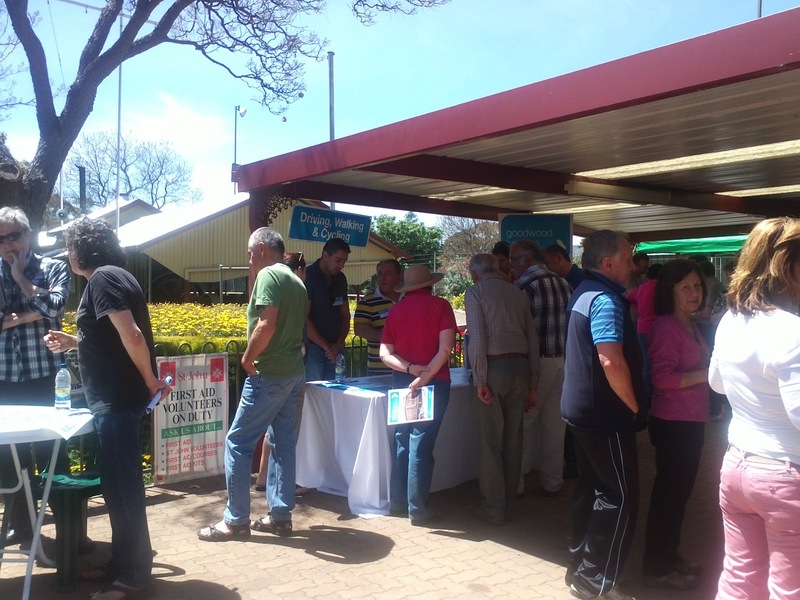 The weather was glorious, the sausages free, train rides for the kids, DPTI staff enthusiastic and over 250 people had passed through in the first hour. By my estimation there were about 6-700 people seeking information on the project. The overall opinion seemed to confirm that this event should have occurred a couple of months ago ( that would be consultation). However, most people that I spoke believed that the outcome will be attractive and their the amenity improved (less noise). I would like your feed back on what you liked and what you didn't so I can continue to support in this. The most significant problem yet to be resolved seems to be the treatment of Brownhill Creek at Forrestville Reserve. Thanks for this information, and starting the ball rolling. I attended the open/info day today, which appeared very well attended, and in the main provided a good overview of this large project. I have logged our concern re the replacement vegetation as a query and expect that someone will return my call with more info. The info I did obtain was that Greenways is funded via a few councils and the funding has been given to DPTEI for the work. I did manage to speak both with the CEO Rod Hook and the deputy CEO Luigi Rossi re matter, the former was non committal and the latter did not know about this aspect of the project. THe other concern is that Victoria St crossing will be closed to cars for about 4 months or so, and I was told that Clarence park crossing will be closed for necessary work overnight, as required., and that East ave will not be closed to traffic. This is a relief, as we will not easily be able to transit Goodwood rd from Cowper. A few points that I think would be worth Council raising: 1. There are automated pedestrian crossing points being installed next to SASMEE Park and at Victoria Street as part of this project. Could council lobby to have such points installed at the East Ave Crossing and at the crossing by Millswood Lawn Bowls. Considering that the Seaford line will have a greatly increased frequency of trains and that the Belair/Melbourne line has trains travelling in both directions on the same track, it would be a great opportunity (and much more cost effective to have it done now) to improve safety at both sites (considering pedestrians have died at both sites, but not in recent years). 2. I find that with these kinds of projects that subcontractors manage to damage all sorts of things from street signs, to roads to trees that are not part of the project and are usually Council property. Could Council get some sort of undertaking that any such damage will be repaired ASAP and not left to Council and ratepayers to cover the cost? 3. Could Council get the project team to provide an enforceable traffic management plan for the project – considering the number of children/sporting activities/cyclists in the area - the last thing the area needs is speeding utes and/or obstructive heavy vehicles causing death or serious injury. 4. I haven’t been able to find anything out about the Leader Street Crossing – is this still proposed to go ahead? I tackled Luigi Rossi (person responsible for delivering the project) on the issue of inconsistent information on the day. There is a big difference between the best case scenario and what is more likely to be the case. I would reckon that the actual time closed will be much longer than either of these estimates. The Leader St crossing is unfunded at this time. There will be a dilapidation survey so Council can charge back costs. Residents should take some photos of their own homes so if damage occurs they have a reference point if damage is done, particularly cracking. I know some people in Millwood Cres are concerned about this, those on the trucking route should also be concerned. I am concerned about how cyclists on the Mike Turtur bikeway which comes along Devon St South will be accommmodated during these works. In my opinion, Council should be considering parking controls on Railway Tce South as things stand. Cars now park on both sides of the street, which is reduced to the width of a single moving car. These are extrmely hazardous conditions for cyclists to be overtaken by car drivers and substantial numbers use the bikeway every day. Both adult and child cyclists have a reasonable expectation that a bikeway route will be safe to use,and that part of the route is not safe during the day, now. Reproduced from the letter to the Editor, Eastern Courier, with Fred's consent. The article on “Traffic chaos during Belair, Noarlunga rail line closures” (Eastern Courier Messenger 15 October 2012) starts to examine the impact of the Goodwood Junction project during construction. It is hard to know how significant the impacts will be. If 30% of the Belair rail commuters (4,000?) use their cars then this is at least an extra 1,200 cars added to the already congested Goodwood and Unley Roads. Defection to cars is likely to be higher, given that the replacement bus travel times will be twice train transit times. In addition there are the Noarlunga line commuters. I am not sure cycling will be more attractive with all those extra cars on the road. Living close to the ‘Goodwood Junction,‘ I am interested in the impact of the trucks and trailers moving the excavated spoil from Goodwood to Bolivar. Spoil will be removed from a channel 10 metres wide, reaching 7+ metres deep and almost 500 metres long. 25 truck and trailers weighing 30+ tonnes each, making 3 trips to Bolivar per day (and return) equals 150 trucks and trailers per day down Fairfax Ave, Leah St and Leader St – that is on average one every 4 minutes, continuously for 10+ hours a day, 6 days a week for up to six months. Impacts will likely be noise, vibration, dust, congestion, delays, collisions, lost business, road damage, kerb damage, lost parking and possibly house cracks. The Development Approval has been given, the contractor has been appointed and work has already started. It is very unclear if the project will reimburse the Council for damage to its infrastructure. It is unclear how many additional measures will be taken to reduce the impact in the surrounding residential suburbs – let alone on the arterial commuting corridors.